I spotted a parked car, the other day, from a family displaying their support for two countries competing at the FIFA World Cup. I'm assuming it's a family based on the stick figure stickers on the rear window. I was too far to see the details of it, but most likely it belongs to two parents and a couple kids, maybe with a pet. It seems to be a trend to showcase who the owners of the car are by displaying personalized stickers in the back. This particular car had two Italian flags attached to the side of it. 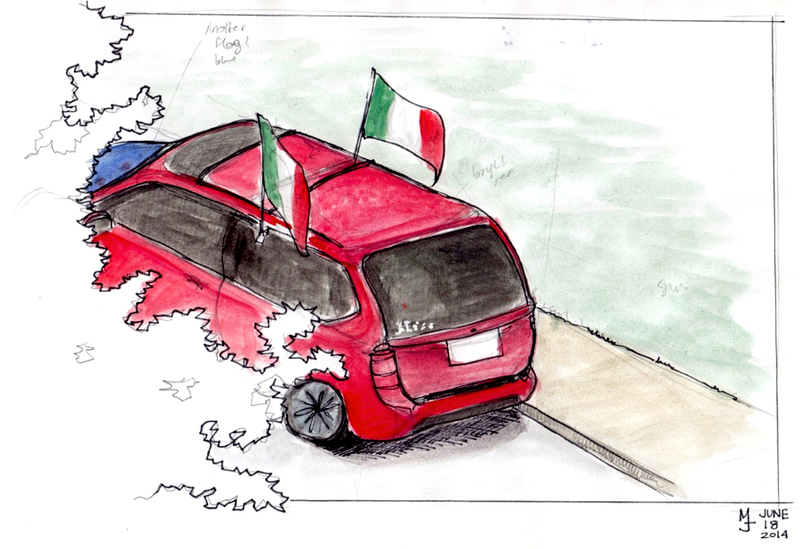 And as I was sketching the car, I noticed that the front was blue instead of red like the rest of the car and realized that it was most likely an Australian flag that they managed to attached to the hood of the car. To me, this is a perfect representation of the diversity and openness of our city. You can support different teams and still get along.